Star Schools’ Matric Rewrite class of 2018 achieved outstanding results in the final National Senior Certificate exam, attaining an average pass rate of no less than 81%. This is the highest achieved by the supplementary education service provider to date. “The figure includes results achieved in English and Afrikaans,” explains COO Yunus Ebrahim. “If languages are excluded from learners’ performance results, the average pass rate achieved is 79.9%, which is significantly higher than the 46.6% achieved by the part-time candidates registered on the Department of Education’s Second Chance Programme. 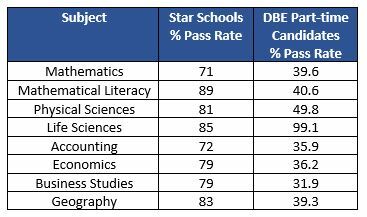 “Further analysis of Star Schools’ results reveals a pass rate improvement in all subjects, with physical sciences showing the highest of 8%,” Yunus continues. “Additionally, two distinctions were achieved in physical sciences. Star Schools congratulates the class of 2018 who have successfully completed the first step in changing their lives. A brighter future now beckons.